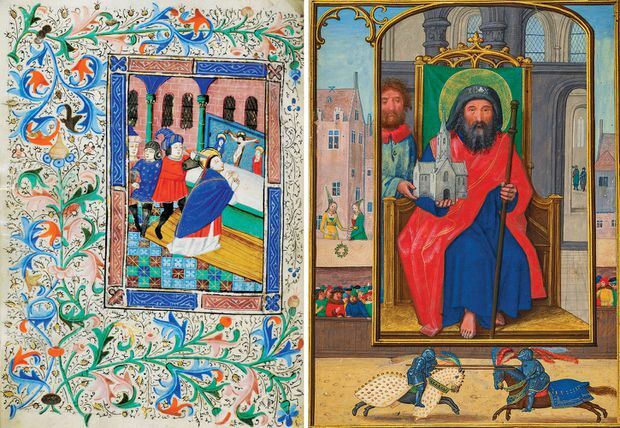 Three of the medieval artworks on display at the Montreal Museum of Fine Arts's Resplendent Illuminations exhibition. Left: Saint Helena and the Invention of the True Cross (c. 1520), from an anonymous artist. Middle: Monk (Hermit) Praying for the Dead Man and Struggle for his Soul Between Saint Michael and the Devil (c. 1470), from the Master of the Échevinage of Rouen. Right: The Voyage of Saint Ursula (c. 1480-1490), from the workshop of the Housebook Master of Augsburg. Not many museum exhibitions offer you a magnifying glass on your way in. That kind of help may be needed when looking at the small images, which pack a large painting’s-worth of detail into spaces that are sometimes the size of a passport photo, in a new show at the Montreal Museum of Fine Arts (MMFA). The pictures are from medieval devotional books, first used in the monasteries and convents where they were made, and later by lay people. They were aids to piety, although once they got out into the larger world, they also became signifiers of status. 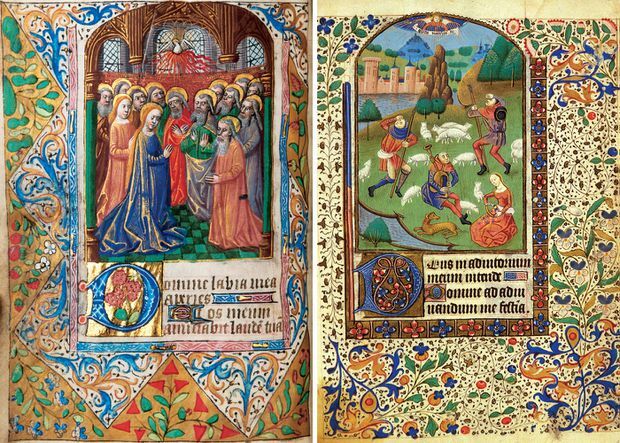 From the 13th century on, private patrons commissioned lavish books of hours and similar items, some of which were executed by the finest artists of the period, using vivid colours and gold accents. That’s fortunate, because no other forms of medieval painting survive in such numbers as these Resplendent Illuminations, as the MMFA has titled its display. Their popularity as private items owes a lot to a rise in literacy in the European countries where they were made. There were also larger technological forces at work, well offstage in this exhibition, without which many of these books might never have been made. One detail of this exhibition, proudly emphasized by the three curators, is that all 59 items on display come from Quebec collections. Some have been in the province for more than two centuries, including items given to religious orders in New France by patrons in the Old Country. The illustrations show scenes in the life of the Virgin Mary, as well as images of Jesus as an infant or at the moment of his betrayal. There are also portraits of various saints, some while being martyred in gory ways. Some of the florid margins include small dragons and human/animal hybrids – a diversion, the curators say, from the sacred subject of the books over all. 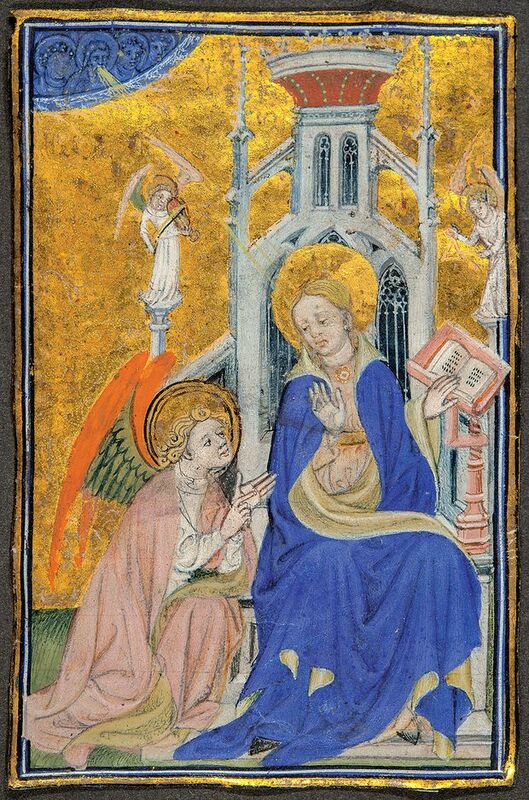 The Annunciation (c. 1400-1410), from the Master of Troyes. The main figures wear medieval dress in surroundings of the times. The present made its mark in other ways, as rich buyers ordered bespoke volumes with their names, initials or faces prominently included. One illustration of saints is smaller than the adjacent banner bearing the names of a newly married couple. Another shows the owner kneeling before the Virgin Mary, as if during a private audience. In a broad sense, many of these deluxe editions, painted on animal skins as in ancient times, were made possible by what French historian Jean Gimpel dubbed a medieval industrial revolution. There was a huge building boom for water mills in France in the 13th century. The owners included lords and monasteries, but also private operators whose mills made them rich from processing textile, iron and grain. These early capitalists had the means to support professional artists making one-of-a-kind books. Hand production was killed off by another revolution, in printing, which by the 16th century could produce small books with full-page engravings. It’s easy to hear a more drastic echo of that demise in the present-day market for books. Many people who say they love reading now spend their spare half-hours looking at social media on their phones. Book publishing has become a riskier thing, and so has publishing writing about books. Quebec remains a striking exception, by some measures at least. The province supports a publishing infrastructure more extensive than anywhere elsewhere in Canada. A recent weekend edition of Le Devoir included a 16-page book section, 10 pages of which were devoted to Quebec authors and Canadians writing in French. It was like stepping into a preinternet time warp. No major anglophone daily in the country does that kind of thing anymore; many no longer have a books editor. Quebec is immersed in the online world like everyone else, but books here are also seen as a pillar of the long, stubborn effort to keep a francophone society of about eight million people viable in a territory surrounded by 360 million anglophones. That determination brings higher state support for publishing, but also a strong commitment by individuals. Being maîtres chez nous includes having a robust forum for writing and reading about it. Whether will and conviction are enough remains to be seen. Otherwise, there may be a future exhibition, such as Resplendant Illuminations, but of Quebec books no longer read from publishers that no longer exist. Left: Pentecost (1475-1480), from the workshop of Maître François (François Le Barbier). Right: The Annunciation to the Shepherds (c. 1470-1475), from the Master of the Échevinage of Rouen. 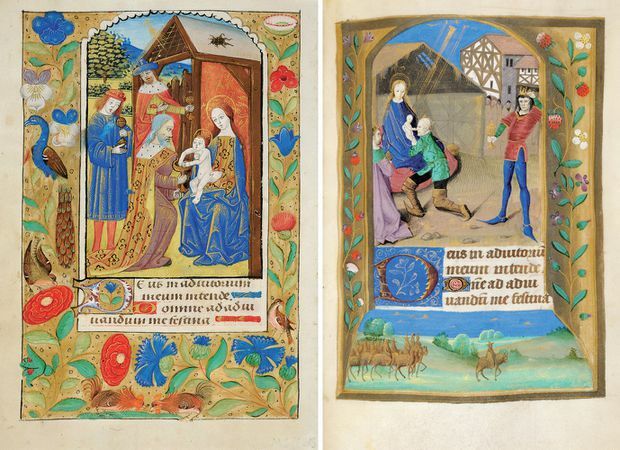 Two works entitled The Adoration of the Magi: At left, from a late follower of Robert Boyvin (c. 1495-1505), and at right, from the Master of the Burgundian Prelates (c. 1480-1490). Left: The Murder of St. Thomas Becket (c. 1460-1470), from the Master of Morgan 78. Right: Saint Sebald of Nuremberg (c. 1515-1525), from Simon Bening.